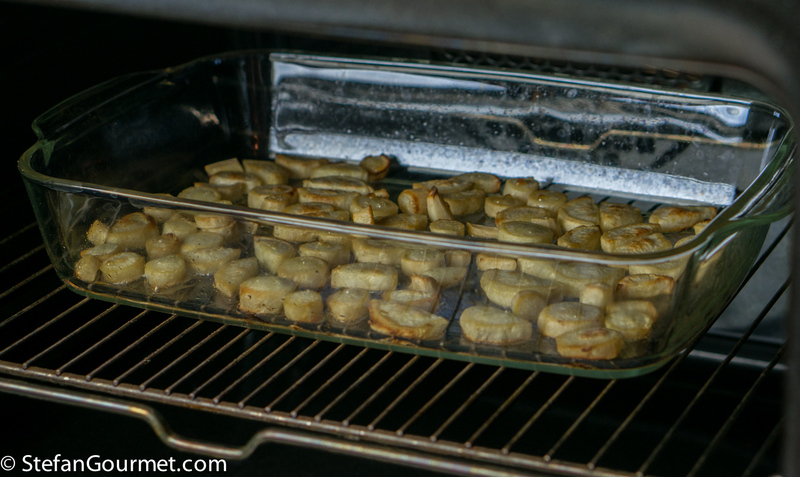 Preheat the oven to 225C/440F. Put 2 tablespoons of beef suet or coconut oil in an oven proof dish and allow it to melt in the preheating oven while you prepare the parsley roots. Since the parsley root will be roasted at 225C/440F, which is above the smoke point of extra virgin olive oil and many other vegetable oils, it is important to use fat with a smoke point that is higher than 225C/440F. Beef suet fits the bill and adds a subtle layer of flavor. Peel and trim the parsley roots and cut them into slices of about 4 mm (1/6 inch) thick. Cut larger slices in half. 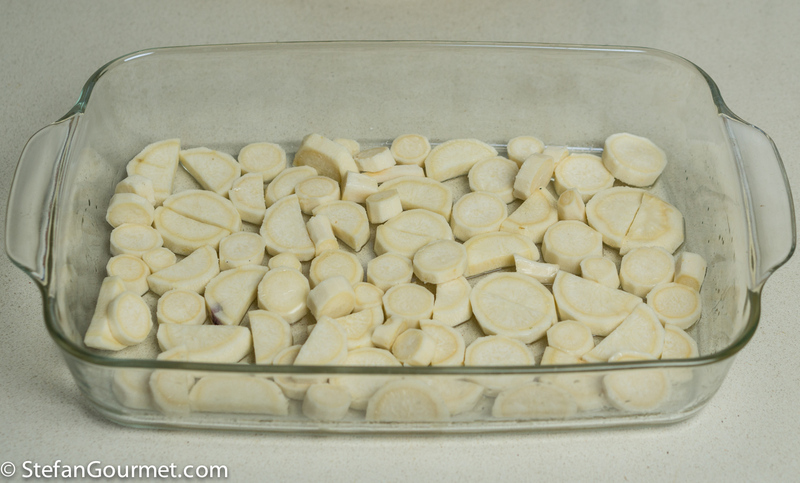 When the fat has melted and the oven has been preheated, toss the parsley root slices in the oven dish, arrange the slices in a single layer as much as possible, and put the oven dish in the oven. Roast for 15 minutes at 225C/440F. In the meantime, bring a pot of water to a boil. 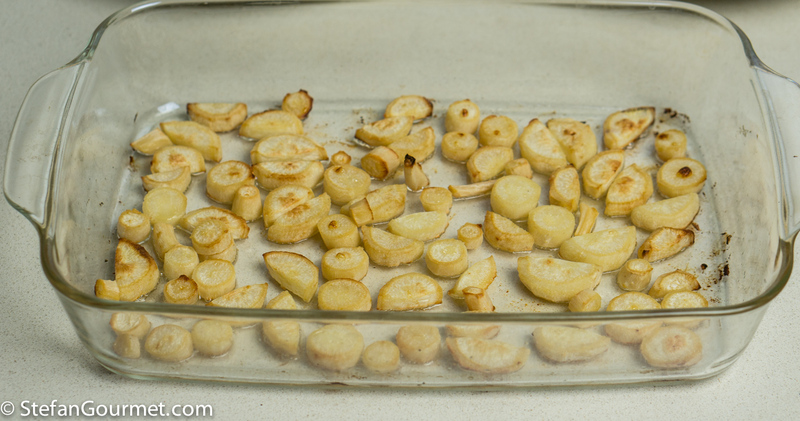 After 15 minutes of roasting, take the dish out of the oven and turn the slices so they can cook evenly on both sides. Return the dish to the oven. 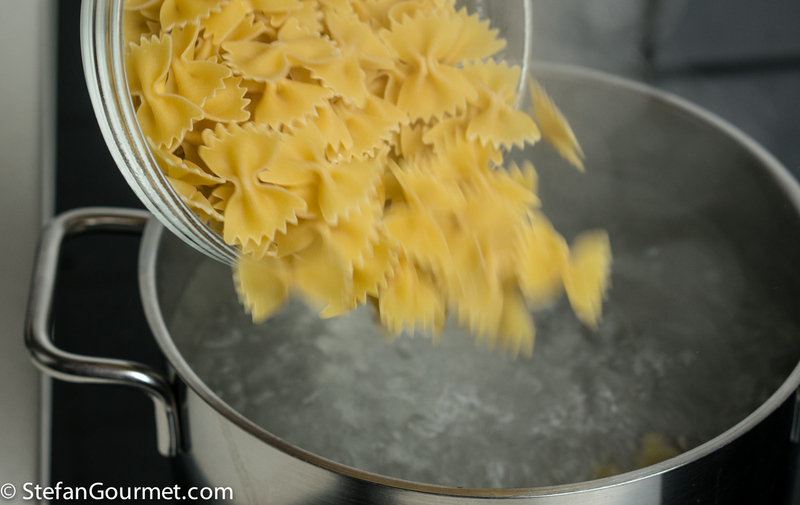 When the water boils, add salt and 150 grams (.33 lb) of pasta, and cook it for the time indicated for al dente on the package. After another 15 minutes or so, the parsley root should be tender on the inside and golden on the outside. 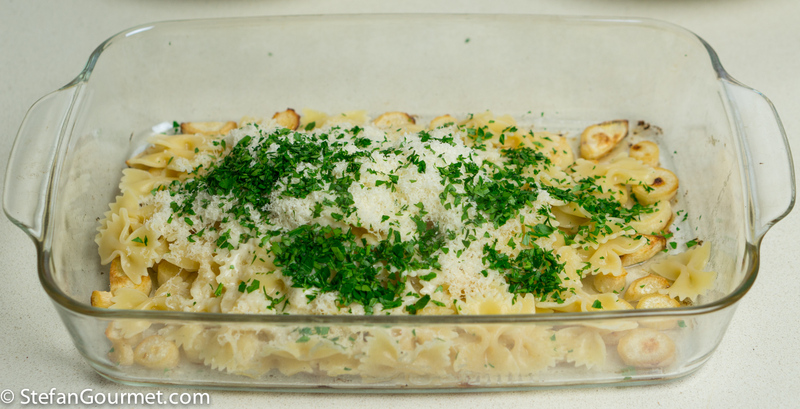 Take the parsley root out of the oven. When the pasta is al dente, drain it, reserving some of the cooking water, and add the drained pasta to the dish with the parsley root. 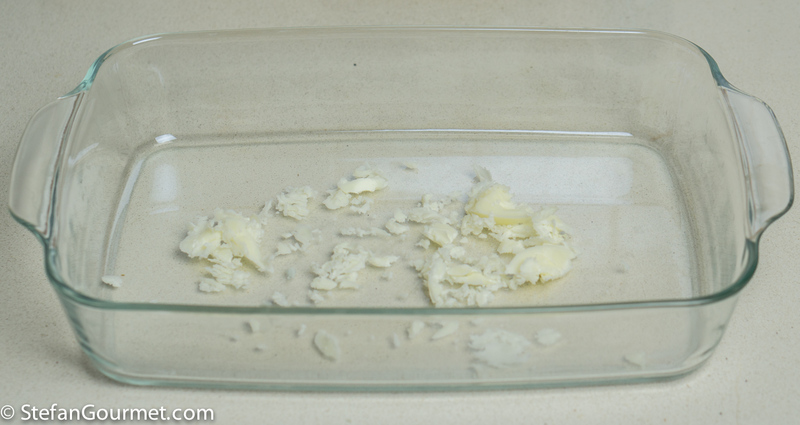 Add 30 grams of freshly grated parmigiano reggiano and about 2 tablespoons of the cooking water. 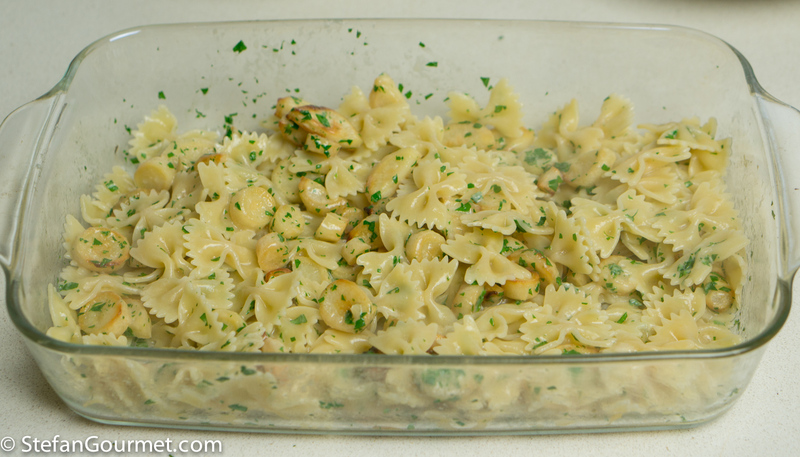 Add a tablespoon of minced parsley as well. 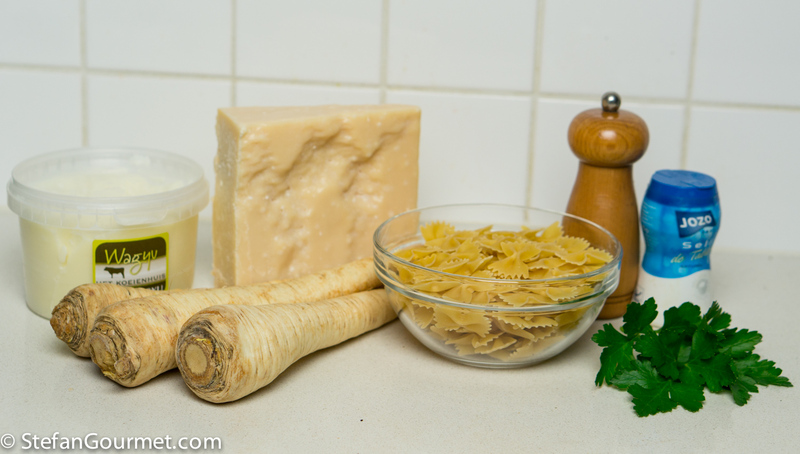 Toss to mix, until the pasta and parsley root are coated with the ‘sauce’ of cooking water, cheese, and parsley. Taste and adjust the seasoning with salt and freshly ground black pepper. Celeriac ravioli with eel tomato sauce is a dish that takes some effort to prepare (especially if you buy live eel and clean them yourself), but the reward is definitely worth it in terms of flavor. 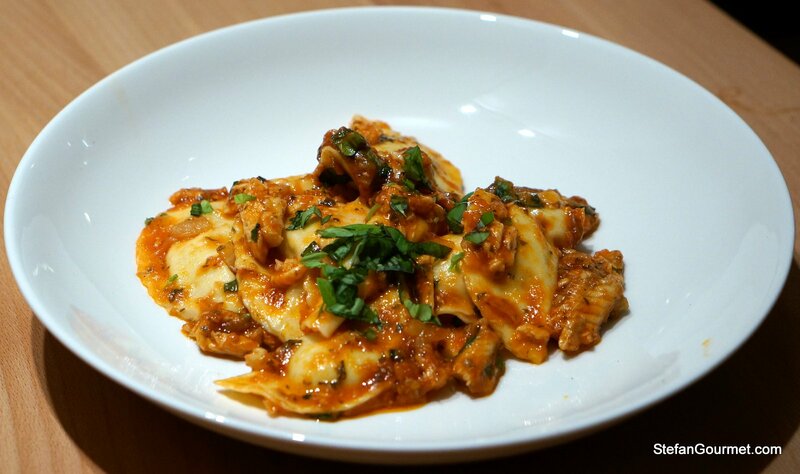 The creamy eel stewed in tomato sauce pairs wonderfully with the earthy celeriac ravioli. Yes, very rustic and delicious looking! Interessante Stefan, ma non ti seguo sulla questione del punto di fumo. Se l’aria del forno è a 225 non vuole dire che i grassi di cottura raggiungano quella temperatura. Prima dovresti bruciare quello che stai cuocendo. Ciao Filippo, hai ragione che l’olio sul cibo non brucia finché il cibo non bruci. Però in questa ricetta tutto l’olio nella pirofila è incluso nel piatto, e la temperatura della pirofila siciramente raggiungerà i 225 gradi. Sopratutto con una teglia di metallo. Si sente l’odore di olio bruciato se usi l’olio extra vergine di oliva. Where did you buy the parsley root? I’ve never seen it here (Haarlem, NL). At Hanos (groothandel, moet je pasje voor hebben), or Lindenhoff in Baambrugge. That looks and sounds absolutely delicious. I’ll have to track down some parsley root. Live a little, learn a lot. I must dig up my parsley plants and eat the roots. This is a very interesting dish and totally new to me! 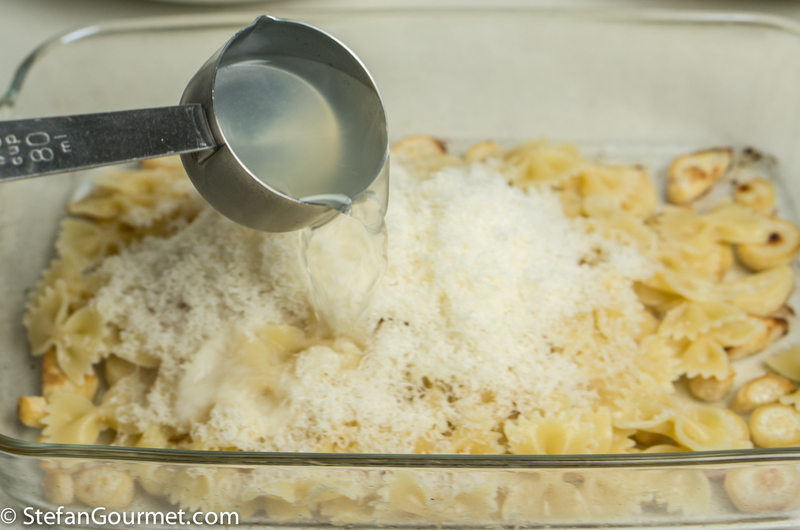 I like the Parmesan/cooking water combination. I bet it creates a lovely “sauce”. Great idea! Thanks, Francesca. 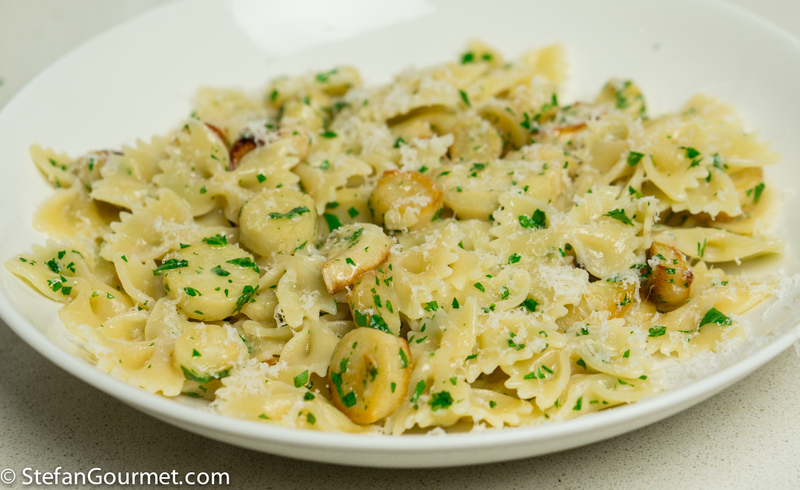 The “sauce” is similar to cacio e pepe, although for that pecorino is used and more of it. 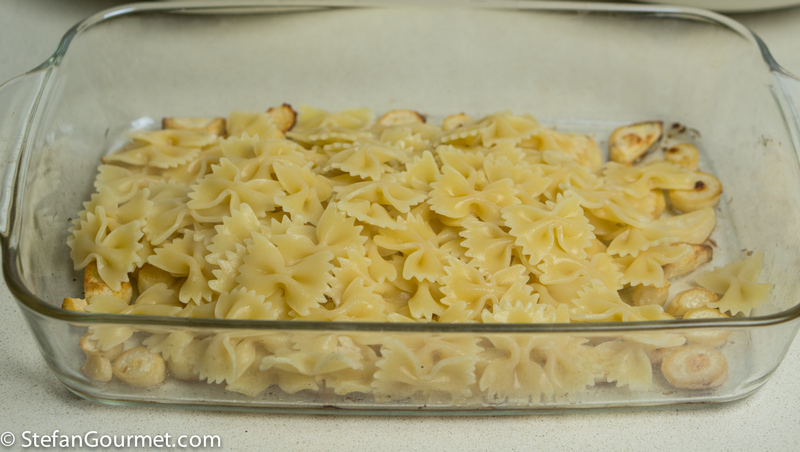 Last night I made this with celeriac (sedano rapa), and it was great as well. Another great post, Stefan. I never knew how to use parsley root and this sounds delicious. 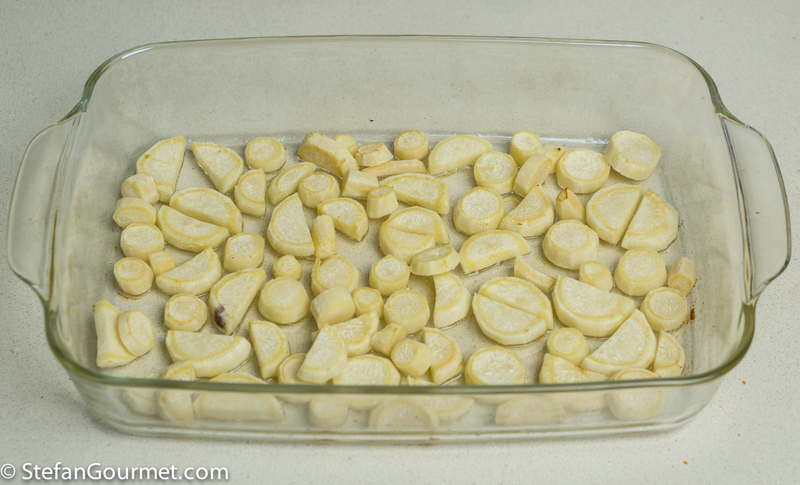 Roasting it would surely bring out its sweetness and add a bit of crunch to the final dish. I cannot remember the last time I prepared a pasta dish and didn’t reserve some pasta water. That stuff has saved many a dish in my kitchen, as well as help to create a sauce as you’ve done.